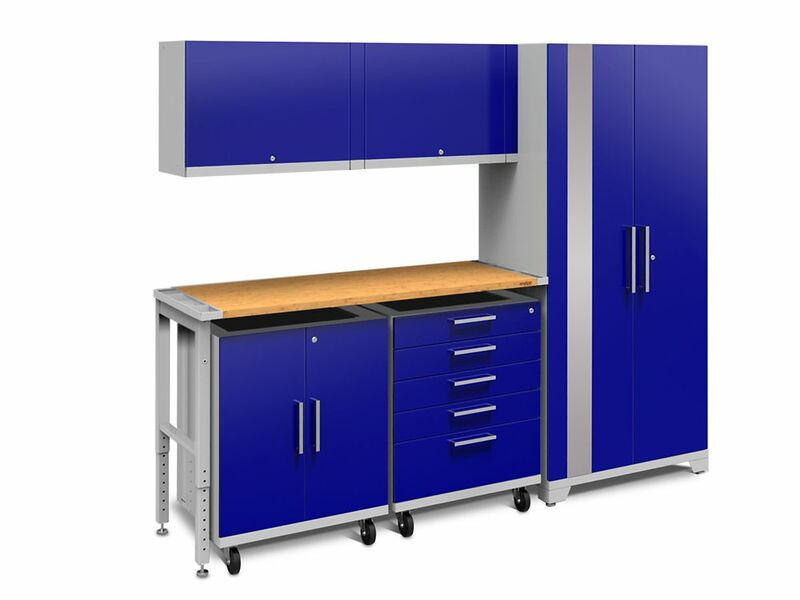 Performance Plus 2.0 Steel Garage Cabinet Set in Blue (6-Piece) with Bamboo Worktop Bring your garage into the 21st century with our newly redesigned, Performance Plus 2.0 Series; our first fully mobile, modular garage cabinet series yet! Each cabinet features fully welded, 18 gauge steel frames with fully lockable double-walled doors; that's 100% stronger than our Performance Series! We've included soft-close door hinges, adjustable steel shelving, full extension drawers, integrated top tool trays on your base and tool cabinets and many more premium features. Our newly designed Mobile Spacer Kit allows you to change your once static garage set into a fully functional mobile set; with included casters, your base and tool cabinets can now slide in and out of your set with ease, leaving your worktop stationed. Performance Plus 2.0 Steel Garage Cabinet Set in Blue (6-Piece) with Bamboo Worktop is rated 4.7 out of 5 by 3. Rated 4 out of 5 by Harley Man from Top notch quality, very well built. I bought this a few months ago and finally was able to install it this weekend. Be prepared to flex those muscles because this stuff is so well built and heavy duty! The instructions are very well written. Read them closely, everything you need is in there! My only complaint was the how my worktop is suspended; one end has the leg set (very solid and beefy!! ), the other end it bolted to the side of the storage cabinet with two small bolts, leading me to suspect that end of the bench won't be able to handle much weight. But aside from that, this product line is absolutely incredible! Extremely well designed and built from quality materials. Rated 5 out of 5 by Dan from Of all the garage cabinet products available on the market these days, this company's products ar... Of all the garage cabinet products available on the market these days, this company's products are superior to all others. They are built to last and their product designs are impeccable. It takes two people to uncrate the shipping containers and install in location desired. I have installed 24 of NewAge garage cabinet products and they look great and help organize any work area like a garage. Since they are made of high grade stainless steel, they wont rust. Their products are superior!! Rated 5 out of 5 by DT from These were delivered a lot faster than I thought they would be. They were packed well with lots o... These were delivered a lot faster than I thought they would be. They were packed well with lots of styrofoam and card board. I had a little damage on the back bottom of the large wall locker but not enough to send it back. They were missing some parts but after the parts were received every thing assembled easily and looks very good. Very good quality cabinets and heavy duty. I am very pleased with them and would recommend them. I would rate them at about 4 1/2 stars because the missing parts caused a delay in the installation.